Heat oven to 325°F. In ovenproof 4-quart Dutch oven, mix beef, onion, tomatoes, seasoned salt, pepper and bay leaf. In small bowl, mix water and flour; stir into beef mixture. Cover; bake 2 hours, stirring once. Stir in potatoes and carrots. Cover; bake 1 hour to 1 hour 30 minutes longer or until beef and vegetables are tender. Remove bay leaf. 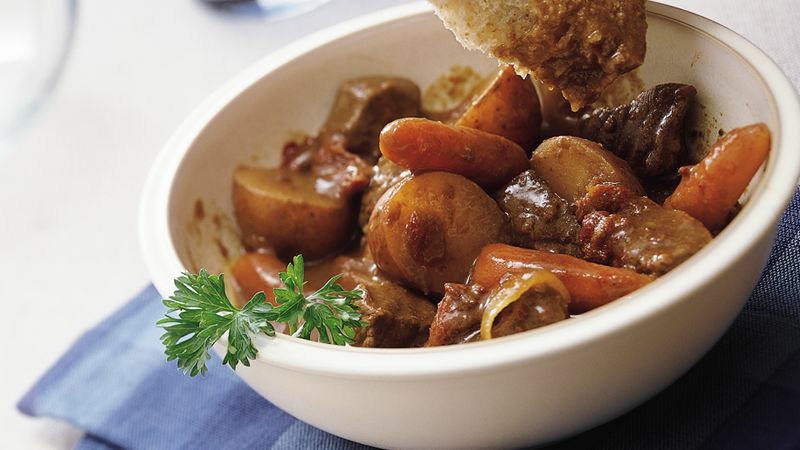 Add a bit of rich flavor, if you have the time, by browning the beef in a little oil before assembling the stew. Purchase small red potatoes that are bright in color, firm and of uniform size. If yours are larger, you can cut them into quarters.